A couple weeks ago I saw this post and thought this would be a fantastic solution for keeping our passports safe and together. 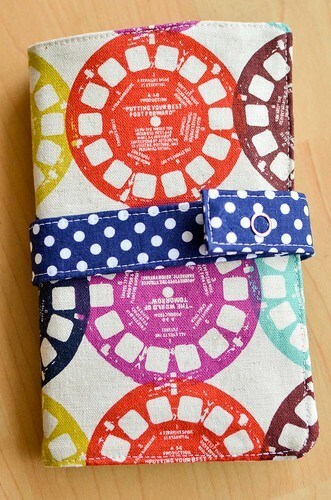 I used up some precious Melody Miller viewfinder fabric for the exterior. And some fun, bright prints for the interior. 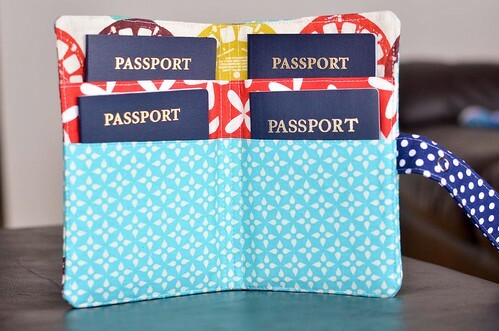 There are only 4 of us so I used the directions for the 4 passport wallet, but the pattern also includes instructions for a wallet that holds 6. The pattern suggests either Pellon Fusible Featherweight or Craft Fuse as interfacing options. I only had Craft Fuse on hand, so I used that even though I was a little worried because it is definitely much heftier than the featherweight option. I would not use Craft Fuse again. It gives the wallet some nice structure, but it was pretty much impossible to get the corners pushed out so my corners are rounded. It also made everything bulkier and harder to topstitch.. In further Craft Fuse woes, I could not get the snap to attach to the end of the strap because it was too thick. I had to move the strap in a little further away from the finished end to get the snap to go through all of the layers. Other than that, I think this is a great pattern and I would definitely make it again. It came together very quickly. Now I just have to go somewhere so I can put this to good use. It looks great Erica. I tested the pattern for Amber before she released it, you can see my version here if you like: http://craftingdotdotdot.blogspot.ca/2012/07/family-passport-wallet-and-pattern.html I found the topstitching a tad tricky with all the layers but I used my walking foot which helped a lot, that and I went really slow. I just made a 6 pocket version this weekend for my sister and her family, and obviously it has one more pocket so even more layers, and that one was really challenging, especially the turning and pressing out the corners, like you said. You did great though, I love your melody miller fabric. I would love to get my hands on some of that view finder fabric. If I ever see it in a shop, it's mine! Lovely passport holder. I made one last month, for our holiday! Very useful, especially the side pocket for driving licences! A great pattern to make! And your version is very pretty! Erica you are a legend for posting this just under your 'Groove' post because we just got all our passports for our first family cruise (10th wedding anniversary) and I only have my single passport holder from my single gal days. Thanks for the heads up about pellon and upside-downy gaffs. I must say I like the style and ease of your blog.